Prioritizing resources and focus based on a clear understanding of a business opportunity will provide the best financial benefit and impact to the bottom line. The statistical fields of Response Surface Modeling and Design of Experiments specialize in reducing complexity and improving the clarity of understanding for given system. In our case, the “system” is the business opportunity. This process and tools will optimize resources, mitigate risk and drive business priority. The idea behind designed experiments is to use statistical principles to have the strongest understanding of a scenario with the least amount of testing needed. In the case of a business, this is very good news because the faster we can optimize our strategy, the more time we spend on items that impact the bottom line. What is the Business Goal? In business, we have hundreds of financial metrics to choose from. NPV, Breakeven, RIO, ROA, ROE etc. This process will work for any metric. At the end of this process, we will have a Pareto of inputs that impact the chosen metrics, and a model that allows you to choose what strategy you will use to optimize that same metric. I personally have done most of my work to optimize NPV and Breakeven Time. This is commonly known as scenario analysis or stress testing in the business world. However, the statistical focus we’ll be developing is on how to systematically choose input scenarios that are comparable to each other so that the outputs of each scenario are comparable to each other. Develop the initial business case. You’re not trying to be perfect yet, just be within reason for all of your initial inputs. You can use the Business Case Financial Feasibility Template as a starting point. Develop the list of inputs you will model and the ability to change each input in your model. Examples include sales volume, sales price, COGS % of sales, engineering expense, etc. If we look ahead to the screening portion, we can see that a screen tests the high and low level for each input. The two methods for choosing comparable input scenarios are to use ±50% for each input factor or to use best and worst case for each input factor (considered 95% confidence intervals). A Screen is where we take all of the scenarios listed and test them at their highest and lowest levels. As we test, note the response of the output metric that was chosen. For example, if we set the price at a low of -50% and a high of +50% what did the Breakeven Time change to in the low and high cases? Document the high and low levels in your list of inputs and calculate the difference between the two as shown in the sample data chart. *For the Breakeven metric, some scenarios showed that the business would never break even. In that case, I chose a max value of 10 years in order to let the chart still work. **For the categoric values, if the category order does not matter we use the lowest and the highest responses without being concerned about which category was listed as high or low. Once we have this list of factors vs the difference in response to low and high levels we can put the factors in a Pareto or a Tornado chart. 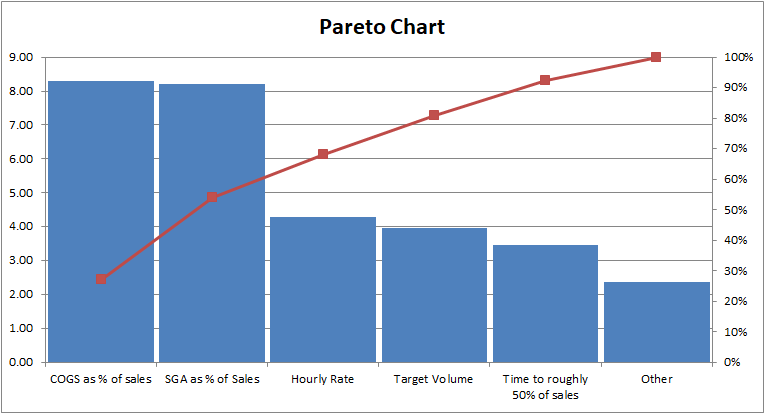 If we follow Pareto’s 80/20 observation then we would only concern ourselves with the first four Factors and would ignore the remaining five. If we set the threshold at 90% then we get five remaining factors and 95% yields six factors. Your choice depends on how certain you need to be in the end. One of the things that I do enjoy looking at is the list of factors that we proved don’t really matter in the range that we tested them: Effective Tax Rate, Long-Term Growth Rate, Growth Model Type, Start of Volume Growth, etc. Surprising, isn’t it? Now, there are some more advanced methods to this that we’re not addressing here. We’re only testing one factor at a time. In most real-world cases there will be interactions between multiple factors. For those cases we would use Factorial designs or maybe Monte Carlo analysis. In the end, the refine stage should include some research on those items. We have already improved clarity by identifying which factors don’t matter to the metric we chose. If we decided to use a different method, then some of those factors would show up again in a different order. You can also iterate back through those factors as needed if the results don’t make sense to you. This is where things get much more specific to the business opportunity in question. The areas which are more important to the specific opportunity should be modeled in more detail than the initial screening models. The model should be the most accurate for the factors that are the biggest deal. If there was a factor scenario that created an error, such as never hitting breakeven in the case of 60% COGS in the sample, then time should be taken to understand what the breaking point is. That will become a critical risk to mitigate. In many cases, this is where more market testing should be done. 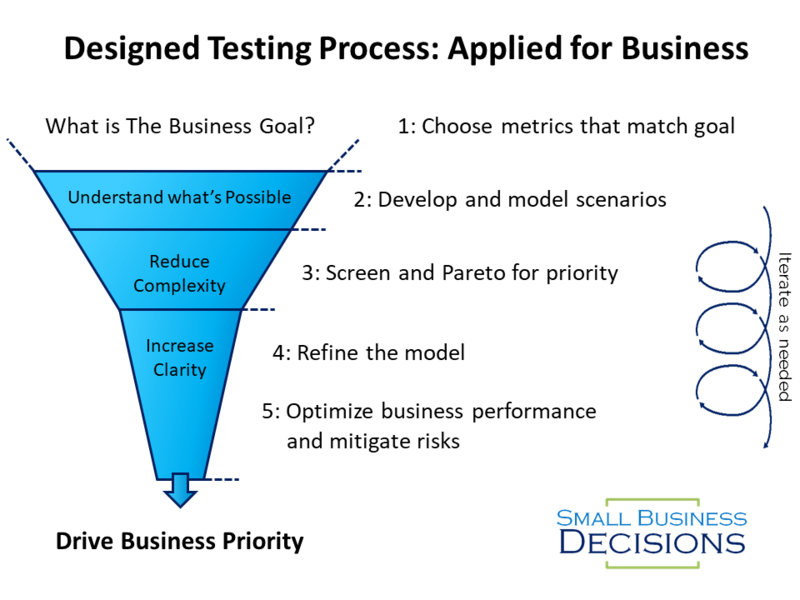 Testing might be aimed at refining benefits to the customer, improving confidence in pricing strategy, getting quotes from potential suppliers to confirm COGS, understanding price elasticity, or defining your marketing strategy. Sometimes the range tested during the screen for one factor turns out to have been too narrow. If that happens, then make sure to consider if that scenario becomes important enough for more focus. Optimize your overall business choices with the refined model. Select targets and assign the resources needed to meet those targets. If the factor is very important, then assign resources to improve performance on that factor. If the factor isn’t important, then limit the resources used to track and manage that factor. Mitigation of Risk comes into play when there are specific factor scenarios that make it impossible to meet business goals. In the sample data set, COGS% and SGA% both created scenarios where the business would never hit breakeven. In that case, there should be a risk mitigation plan in place to ensure that those factors do not go off course as well as a KPI on the program dashboard to keep a close eye on it. Just want to say your article is as amazing. The clearness in your post is just great and i could assume you’re an expert on this subject. Fine with your permission let me to grab your feed to keep up to date with forthcoming post. Thanks a million and please keep up the gratifying work.